The Sans Soucy Legacy Wine Club! Your membership and club privileges begin immediately. The approximate cost for each shipment will reflect the wine club level you select. Your credit card will be billed automatically prior to each quarterly shipment. * Wines will be shipped via UPS and will require the signature of someone who is at least 21 years of age. * Wines may not be shipped to states where prohibited by law. * You may cancel your membership after a minimum of 4 club shipments. * Cancellations must be received in writing 30 days prior to the next wine club shipment. The gift of a Sans Soucy Legacy Wine Club Membership is sure to please any wine lover. Annual gift subscriptions can be selected from any one of the wine club levels. -COMPLIMENTARY QUARTERLY CLUB MEMBER “PICK-UP” PARTIES AT THE WINERY FOR MEMBER AND TWO (2) GUESTS BY RESERVATION. THE ANNUAL SHRIMP & WINE FESTIVAL AT SANS SOUCY VINEYARDS. 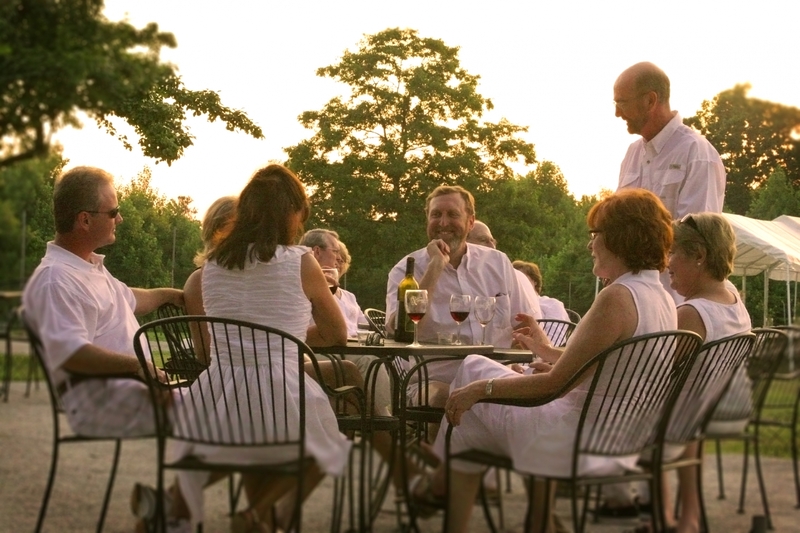 -EXCLUSIVE ACCESS TO SANS SOUCY WINERY SPECIAL EVENTS AND MEMBER ONLY EVENTS. -EMAIL UPDATES AND NEWSLETTERS FEATURING SPECIALLY PAIRED RECIPES,WINE SPECIALS, & WINERY EVENT INFORMATION. -EARLY ACCESS TO CLUB- MEMBER- ONLY NEW RELEASES AND “FUTURES” OF UPCOMING VINTAGES. -TOURS OF THE WINERY AND VINEYARD AVAILABLE BY APPOINTMENT. -SPECIAL DISCOUNTS AT SELECT LOCAL HOTELS, B&B’S AND RESTAURANTS. Note: All Shipments are made via UPS. Shipping available to VA and FL only at this time. You most notify us, prior to ship date if you you choose to pick up your wine at the pick-up party vs. ship to your door.